BJP President Amit Shah on Saturday said the TRS owes an explanation to the people for imposing additional poll expenditure on Telangana by going for early elections to the state Assembly.He wanted to know why the Telangana Rashtra Samithi (TRS) imposed early polls on the state when Lok Sabha and Assembly elections are slated to be held nine months later.Shah, who arrived here to launch the Bharatiya Janata Party's poll campaign, told a news conference that Telangana Chief Minister K. Chandrashekhar Rao had initially supported Prime Minister Narendra Modi's idea of "one nation one election" but he was surprised when he suddenly changed his stand. "Rao and TRS have forced a small state to bear expenditure of two elections. BJP believes that TRS has put an additional burden of crores of rupees on people to further its political interests," said the BJP chief.Shah, who will be addressing a public meeting at Mahabubnagar on Saturday evening to kick off the party's campaign, said that the BJP was ready to give a tough fight to both TRS and opposition Congress in every constituency. He was confident that the BJP will emerge as a strong and decisive force in the state.Shah said there were no chances of TRS getting a fresh mandate. "If the TRS government comes back to power, it will continue its politics of appeasement," he said slamming it for passing a resolution to provide 12 per cent reservation to Muslims and sending it to the Centre for its approval. "Shah denied reports that BJP was hand-in-glove with TRS and alleged that it was the TRS and Majlis-e-Ittehadul Muslimeen (MIM) which were engaged in "shadow boxing".The BJP leader ruled out any any alliance with TRS. 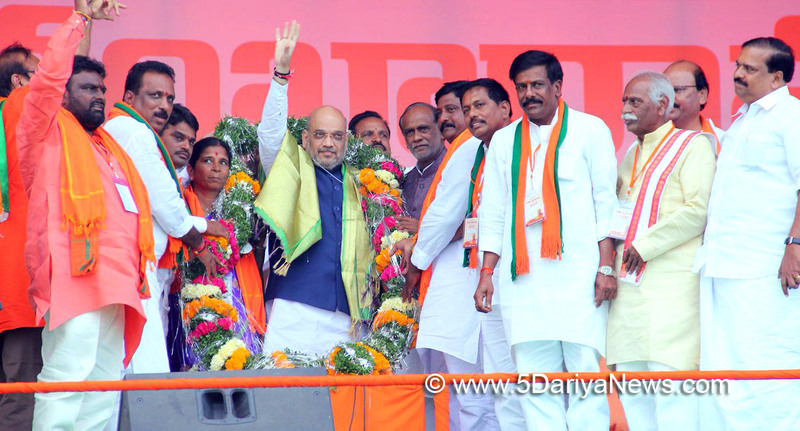 Replying to a query, he said Modi's praise of Rao during his speech in Parliament was in a different context and it cannot be interpreted as an understanding between the two parties.Claiming that the Modi government provided Rs.2.3 lakh crore to Telangana during last four years against Rs 15,000 crore given during Congress rule, Shah said the BJP showed no discrimination towards any state but was opposed to politics of appeasement.